The work-horse machines in our range. They are designed for the majority of pulling requirements. They can handle a wide range of general-purpose extrusion hauling needs. This includes flexible, semi-rigid & rigid hose, pipe & profile. The puller belts are driven directly by twin Lenze AC servo motors through sealed-for-life planetary gearboxes. Two Lenze servo drives are used; one for each motor. These are perfectly synchronised for optimum belt speed control. Twin direct-drive Lenze brushless AC servo motors. Twin zero-backlash planetary boom gearboxes. Twin Lenze top-level digital AC servo drives. Digital speed control via Siemens colour touch-screen panel (109 mm : 4.3"). Display of caterpillar belt speed in m/min. Display of measured length in 0.1 metres. 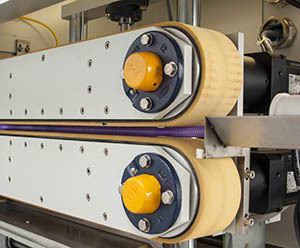 All machines feature twin poly-vee belts covered in heavy-duty sponge neoprene. Alternative coverings are available. Datasheet - Accra-Pull UA-P95 Caterpillars (PDF). Datasheet - Accra-Pull UA-P150 Caterpillars (PDF). Drawing - Accra-Pull UA-P95-LT & LHD (PDF). An adjustable height slitter blade that can be integrated into one of our medium-duty caterpillar pullers.